Regular readers of this weekly column know that I typically recap interesting Google (s goog) Android news from the prior week. Occasionally, I make an exception to cover one specific Android item, and today, I’m doing just that. Why? I ordered a Galaxy Note 2 from overseas on Sunday morning and it should arrive within the week. The new phone cost me a pretty penny — £449.98 ($727 US) delivered from the UK to the U.S. — but I tend to buy unlocked devices off contract. I have an invitation to a Samsung press event in late October, which is likely to be the U.S. launch of the Galaxy Note 2 and if I were to buy one at full price from a US carrier, it would likely cost nearly as much anyway. I certainly don’t need another smartphone — I currently use a Galaxy Nexus with a $45 a month Straight Talk SIM — but the idea of a device with a mix of phone and tablet form factors is intriguing to me. The original Galaxy Note did as well, but I didn’t feel it was enough of a change from my Galaxy Nexus to spend the money. This time around, I feel differently in terms of the form factor, hardware and Samsung’s updated TouchWiz software with more functionality for the included digital pen. The YouTube ID of hOX3HYDwTCY?hd=1 is invalid. The new S-Pen and dual digitizer add a new hover view, similar to functionality provided by a mouse cursor on traditional computers. I originally thought this was gimmicky, but the video shows some smart uses. Hover over a calendar event and you get the details without the phone opening a completely new screen, for example. The new multitasking feature that shows two apps on the screen at the same time reduces home button presses and app switching. Until recently, our smartphones and tablets have been single app at a time devices; that changes on the Galaxy Note 2 and previously, the Galaxy Note 10.1. Granted, only certain apps support this feature for now. Still, I see productivity potential here. Related to the two apps on a screen simultaneously is the dock-like app launcher around the 2:07 mark in the video. There’s no need to tap a hardware button and scroll through pages of apps — our traditional smartphone user interface — when you can customize a floating dock and tap or drag an app for usage. 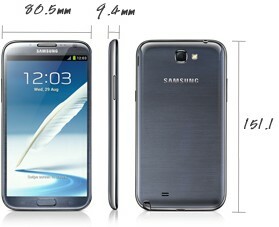 I like that Samsung slimmed the width as compared to the original Galaxy Note. I found that device a smidge too wide for my hand. 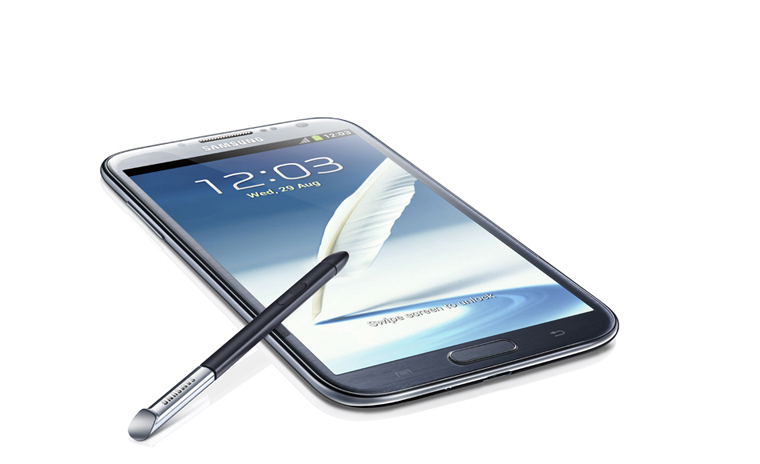 And the S-Pen was to small for me to use comfortably; the new one is longer and has a more ergonomic design. Along with these changes that further bridge the gap between desktop and mobile computing, the hardware on the Galaxy Note 2 is impressive; possibly the best for any Android phone at the moment. The 1.6 GHz quad-core Samsung Exynos chip paired with 2 GB of memory ought to make this device blazing fast and it should be helped by the performance improvements found in Android 4.1. 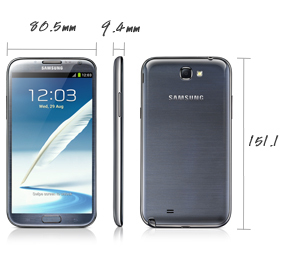 The 5.5-inch display uses a 16:9 aspect ratio, making the Galaxy Note 2 look like an oversized Galaxy S III. Gone is the PenTile display in 1280 x 720 found on my Galaxy Nexus (which I find quite good); the Note 2 uses an HD Super AMOLED screen in the same resolution. Pixel density is down by comparison, but I suspect the lack of PenTile will offset any clarity loss. And while I’m fine with the 5 megapixel camera found on my Galaxy Nexus, I’m looking forward to the 8 megapixel sensor and improved camera software in the Galaxy Note 2. I’ll very likely keep my Galaxy Nexus, mainly because it gets software updates directly from Google as soon as they’re ready. Heck, I kept, and still have, my old Nexus One, purchased in January of 2010 for the same reason. It’s possible however, that a 5.5-inch phone that doubles as a pseudo-tablet could replace my Nexus 7 tablet. That’s one of the many questions I’ll be looking to answer for myself as I review the new Galaxy Note 2. Stay tuned for a video look at the device when it arrives, which of course will be followed up by a full review! What do you think about getting a docking station and using a chrome desktop computer? thanks Kevin cant wait to see the review. I would like to buy it, but am too uncertain how i would obtain service with the device considering i am a sprint customer now, but am no longer with a contract. Boost, metro, att, t mobile ect. lots of choices, but which data network is more compatible with the Note 2 ? which carriers can i use with the international version? This international model works on AT&T’s HSPA+ network – no LTE that I can see. Should also work on T-Mo for voice, but EDGE for data — unless you live in Las Vegas where T-Mo has already refarmed its 1900 MHz spectrum for HSPA+. More cities to follow, but that will take time. Really tempted on ordering online seeing as I would buy it off contract in the states anyways. But I’m gonna hold off and make sure AT&T LTE works first. Jon, good call. I don’t think this unit will have LTE support at all. Obviously, the AT&T version will. Shot your load too early. Should have waited for 5″ 1080p screen Nexus 5 hehehe. Hello all: to Kevin and all those of you that already have it. Can you indicate where you bought it? I am in the US so would need to order it for delivery. I have the note 1 and l love it.finding new things everyday that are so nice.coming from iPhone it was a bit of a learning curve but not terrible. Do you know if the note 2 supports credit card Swype? I use Payware and note 1 will not allow me to Swype cards.they say the phone is not supported! I’m losing big bucks by manually keying in card sales. Also.do you know how I can get a note 2 without getting killed by the price considering I just picked up my note 1 six months ago? Not sure on the Payware support, Andy. I’m thinking the folks behind that service could better answer the question, but it doesn’t bode well that the first Note isn’t supported – I wonder why? There’s no way to find a “cheap” Galaxy Note 2 considering it’s just now starting to ship and isn’t yet available in the US. I’d say recoup what you can on the first Note by selling it and put that towards the new one! The video of Samsung Galaxy Note 11 is fascinating. set for sure. I am up for one. Great choice Kevin! After using my Note 10.1 tablet unlocked and getting great speeds on AT&T, I also rather get the unlocked version Note 2, as we can expect to see the AT&T branded sell for around $599 plus tax. This would bring the Note 2 around $670, this depends on your states tax so $727 is a great price for it to be unlocked. Also usually you get updates a lot quicker than the AT&T branded. Thanks to Kevin, now I am going to think about ordering my Note 2 or keep my SIII? Hi just wondering if you can let me know the website so I can place an order aswell Â£450 sounds like a good price. One step remains to reach the Star Trek criterion for personal computing. User facing camera’s and microphones should work together so that user voice and gestures cross check each other in 3D. Highly reliable face recognition and lip reading could make personal computing a reality for more than just handheld devices. Jobs’ entire career was devoted to breaking IBMs degradation of man in the man/machine interface. GUIs and TouchScreen are about to be made optional in a keyboard-optional computer assisted world. It’s ironic that ecosystem of large/small tablets of iPad/iPhones that Jobs created won’t really need touchscreens. Can you please help with where you made your purchase of the Samsung galaxy Note2 in the UK as I will like to purchase from same store. None of the stores I have checked in the UK are selling for that price. I will truly appreciate. Sure, I bought it from Handtec and the link is in the post. Ok.. Just checked the link you provided. Ordering from outside UK excludes the VAT. Was wondering initially how come it goes for that Â£449 you mentioned. Thanks. Will be waiting for your review. belushi (for some reason I can’t reply to your below post) I just ordered from Handtec this morning. The phone is 434.99 UKP plus 14.99 UKP for Fedex delivery to the US. So, 449.98 UKP. I am really thinking of making the quantum leap from the iphone 4s to the Galaxy note 2. I have looked at everything on the market and the upcoming big boys like the lumia 920. I know the new note is big and I’m sure I’ll get some strange looks when I hold it to my ear. However, I dont use a phone as a phone much anymore in the car its bluetooth and headphones elsewhere. Most of my usage is ‘smartphone’ and this phone is surely smart! Where in the UK are you geting yours from??? Getting mine from Handtec; I know that Clove has them as well, but they were a few pounds more. Hello Kevin. I just checked handtec now and the price displayed for the Note2 is Â£521.99. Could I be mixing things up because that is quite high compared to the price you purchased yours. Correct, that’s the price with VAT. Since I live in the US, I don’t pay VAT. It would be nice if you could do a comparison with the market leader iphone 5. I hate to break it to you but the UK n7100 does not have the multi-windows feature, nor the floating dock. That is only for the Korean note2. can you really hold a 5.5″ inch screen comfortably in your hand and have a 20 minute telephone conversation? Good observation re form factor. The final word is a long way from being written in regard. I think 5.5′ is too big, I preferred the Note one’s 5 inch screen. If they were going to make a 5.5 inch device they should have gotten rid of the home button and make it a touch screen only device such as the galaxy nexus. Jason, I hear you on the home button; not a fan. But, as in the Galaxy Nexus, you lose some screen real estate with software buttons. Yeah….I have an iPhone 5, galaxy nexus and just sold my lumia 900. I have been on the fence about getting a 920 or a Note 2….. I think I am going with the Note 2 at this point. Looks great so far can’t wait to hear your thoughts when you get it Kevin! Would I be able to plug in my AT&T sim in the uk ordered galaxy note and use it in the us? Absolutely; most any unlocked phone bought for the UK works with AT&T’s HSPA+ frequencies here in the States. BUT: I don’t know the LTE frequencies in this model, so that may be an issue for you. My SIM doesn’t support LTE service, so that’s a non-issue for me. For most, however, it’s something to be aware of. Not a dumb question at all – it’s a good one! Some of the places I’ve bought from overseas see the US shipping address and send a charging adapter with the device. If not, you can pick one up – Radio Shack tends to carry them, but I’d bet other local places do as well. Correct, it uses a microSIM. Knowing that, I spent $8 on one from Amazon and cut my SIM yesterday. Look for one that includes SIM adapters so you can still use the SIM in other devices. Would I be able to get a cutter with adapter and cut the existing sim to fit in the Note 2? I am thinking if I have the adapter I can switch out the same sim between my Galaxy S2 and the Note, correct? If so, can you recommend a good cutter with adapter? Maybe something from Amazon? So far playing with the note 2 on wi fi and Love it! No dice. I cut my sim, inserted into the Note 2 and received an invalid sim, contact customer care message. :( Fortunately I was able to use the included adapter in the Noosy cutter and the new cut sim still worked in my old Galaxy S2. Any idea why it wouldnt work in the Note 2 if it still works in my Galaxy S2. Ok, I probably wont be bothering you again. I searched online and found the sim was locked to my other phone but called customer care and they unlocked it. Put it back in and BAM!! Note 2 is working on my old sim. Thank you for all of your advice and help. I am thrilled to have my new Galaxy Note 2 up and running!! I’m very much looking forward to this review. Note 2 seems such a logical combination of two useful devices and I keep waiting to hear/read how likely it is to fully bridge the gap. I just picked up the first Note. I was gonna be content and wait a bit for the 2, but the more I read about it… Less width and bigger stylus are excellent improvements. Loving the Note! Phillip, I am just wondering now what real differences there are between the 1 & 2. Kevin would you be willing/able to comment on that in your review? When you get your Note II, can you upload a speedtest video using your straight talk sim? I don’t know if straight talk is good for an out of the states phone. thanks! Ram, I’ve done a number of speedtests using ST SIMs (for both T-Mo and AT&T’s networks) and they give the same HSPA+ speeds as a native operator SIM. There’s no speed limitation. Thanks for sharing that, you mentioned something about galaxy note dual sim, is the dual sim function supported at the note2?? If this true then it Is worth ordering immediately?? Awaiting ur reply, thanks again! Loay, the model I bought isn’t a dual SIM device. I have service that supports either T-Mobile or AT&T through Straight Talk, but each has a separate SIM. Hope that helps. The note intrigues me. Hope to see a video of your impressions after you receive it. By the way, do you think the James in the messaging app demo is James Kendrick? ?